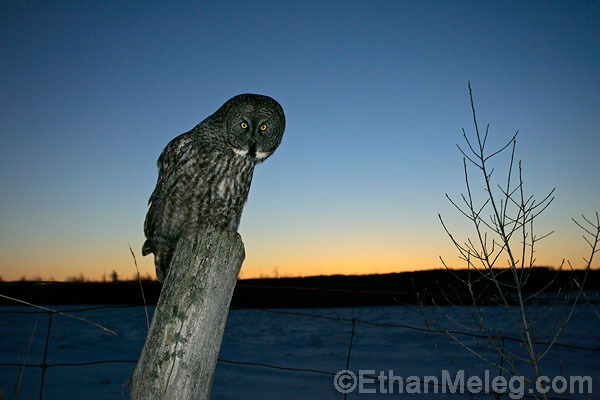 A GREAT (Gray Owl) Photo Opportunity! If there’s one thing I’ve learned in nature photography, it's to make the absolute most of a good photo opportunity. As the old saying goes " make hay when the sun shines". This winter has been one of those exceptional situations. 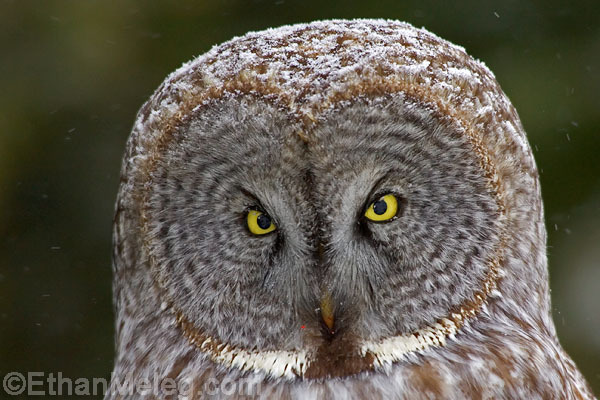 Great Gray Owls started showing up in the region where I live (central Ontario) in early winter. Before long, the region was full of Great Grays, a species that's normally scarce this far south. Residents of northern boreal forests, the owls move south about once a decade, when prey population cycles in their home range crash. This winter the invasion has been particularly huge - a dream come true for an addicted bird photographer like me! Knowing I might never see another influx of Great Grays of this magnitude, I set myself a goal to photograph the owls with intensity. To capture as wide a range of behaviours and situations as I possibly could. To push my personal photographic envelope and make shots that gave justice to the beauty, hardiness and elegance of Great Grays. This was the best chance I was ever going to get. For three consecutive weekends this January (2005), I made the 3 hour drive from my home to photograph the owls at a relatively unknown location where I could shoot undisturbed (I'm sworn to secrecy about the spot!). I spent long days out in the field, shooting thousands of photos in a myriad of situations. The weather ranged from a balmy 0C and sunny to the worst blizzard I've ever been out in, with driving snow and wind-chills to -35C. At one point it was snowing so hard I was unable to see an owl sitting on a spruce tree only 40 feet away! And I loved every minute of it! My photographic approach started out as usual - to capture basic full-body portraits with simple, clean backgrounds. I see many photographers stop shooting at this point, satisfied they've captured the definitive photos of a species. To me, this is just when the real shooting starts! So next I set my sights on making images that conveyed a sense of the snowy conditions, which was easy to do considering I was in a blizzard. Sunnier weather on my next shoot inspired me to work on in-flight images, which I spent many days at. A combination of persistence, gallons of hot coffee, and the incredible autofocus technology of my new EOS 1DmII body landed me the action photos I had been dreaming of. And lastly, when a crystal clear winter sunset turned the sky deep purple, I shot in the fleeting light to capture moody environmental shots of Great Grays with my wide-angle lens. The experiences I had with Great Grays this winter were some of the most incredible moments I've had in over a decade of nature photography. The memories of cold days spent out with the owls will warm my thoughts for years to come... remembering the sheer thrill when one owl struck a mouse only a foot away from me, or the serenity of watching the sun set behind a perched owl, the sky ablaze with colour. How could life get any better for a nature photographer.... making the most of those unique moments! 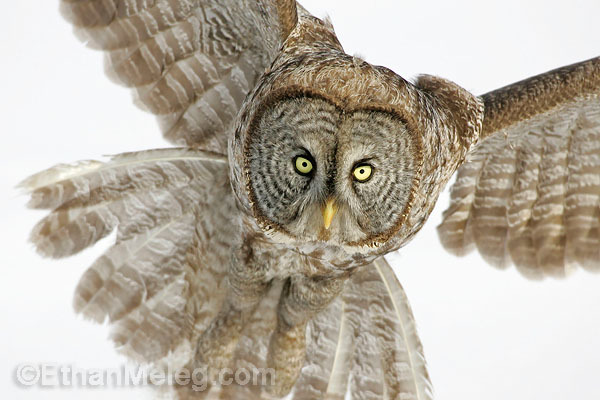 Great Gray Owls photographed with Canon EOS 1DmarkII body, EF 600 f/4, EF 70-200 f/2.8IS, EF 17-40 f/4 lenses. Digital capture in raw format, converted with BreezeBrowser. Minor Photoshop adjustments made to match the original scene. All images are copyright Ethan Meleg.